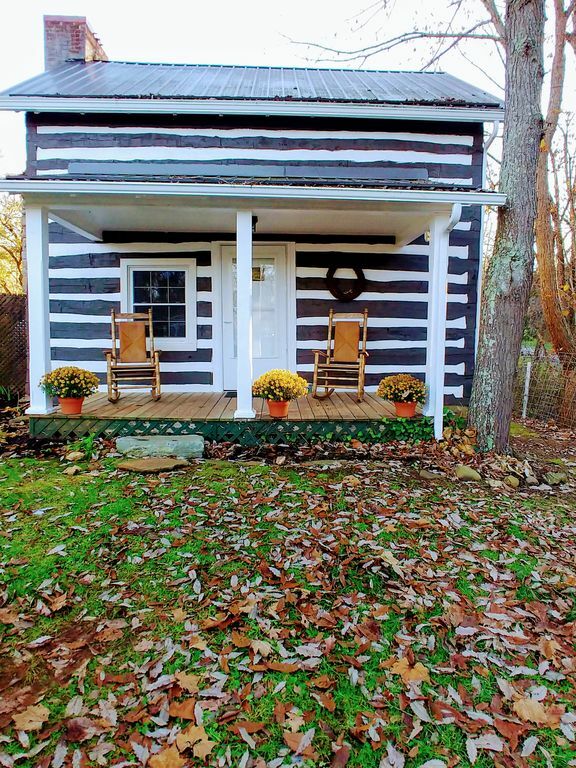 Snuggle with Your Honey in our Cozy Log Cabin! A place to make Memories in all Seasons! The Cabin is the perfect place to celebrate a Special Occasion such as your Birthday, an Anniversary or Honeymoon or just to have a quiet weekend away from the Kids. Relax and forget all your worries and experience a slower, carefree Life in our Historic Cabin! Maybe you'll be lucky to have an overnight rain shower while you're there. Imagine being lulled to sleep by rain on our metal roof. It's truly a magical experience and our queen-size bed with luxury linens is so comfy! But as they say, Don't take our word for it: Check out our Reviews! Plus you don't have to leave your Pets at home. We welcome your well-behaved Fur Babies. If you're looking for outdoor Activities, we're only 1.8 miles to the SHOT TOWER STATE PARK, Entrance to the New River Trail State Park. This State Park is an unique 57-mile linear park that follows an abandoned railroad right-of-way. The trail parallels the scenic and historic New River for 39 miles. Our Cabin is 4 miles from the Park Entrance at FOSTER FALLS. Enjoy hiking and biking on the Trail, canoeing on New River, horseback riding and More. History buffs will love this property built of rare CHESTNUT logs. It’s difficult to pinpoint when the house was actually built, but a historical society who toured the house determined that it was constructed around 1850, which makes it one of the oldest, existing structures in Wythe County. If only these walls could talk. It would be amazing what they would say. While many of the historic features have been preserved, year-around comfort is insured by the heat pump. Enjoy the beautiful knotty pine paneling and large stone fireplace with gas logs in the Living Room. Remote Controlled Gas Logs ignite with the touch of a button. There’s a very comfy sofa and recliner. The modern Kitchen has all new appliances: full-size electric range, refrigerator with ice maker, new dishwasher and microwave/convection oven and toaster. Dishes, glassware and pots and pans and lots of utensils are included so that you can serve dinner in the eat-in kitchen with roomy table with hidden leaf. There is also a drip coffee maker with supplies for your first pot supplied. Basic seasonings, coffee creamer, sugar, sweetener are also included. There is also an LG stackable washer/dryer and half bath just off the kitchen. Deck overlooks Shorts Creek which flows into the New River. Gas Grill for cooking steaks or your own New River “catch–of-the-day” on the back deck. Exposed chestnut logs grace the second floor bedroom which has a large walk-in closet and newly remodeled full bath with a glass enclosure for the tub/shower. Generous-sized towels included. There’s a comfortable Pillow-topped queen bed with luxury linens. Be lulled to sleep by the musical lapping of the creek which you can hear outside your open window. Stay up-to-date on current events with two 43" HD flat screen television sets: one in the living room and one in the bedroom. Basic DirecTV is included. In the Alford Family since 1952 and inherited by the two Sisters, Ann and Judi. The restoration was started by our Father, Kent Alford in the 1950's. A Unique property constructed of rare Chestnut logs. The chestnut trees were mostly killed by blight in 1904 and to this day are still affected by it. Overlooks Shorts Creek which runs into the New River. Near New River Trail State Park which offers hike, horseback riding, canoeing and kayaking. The historic Shot Tower is also located in the Park. Small historic town nearby of Poplar Camp. Mountains surround the cabin. Located on Rt 52. One mile from Interstate 77. 1.8 mile to the Shot Tower entrance to the New River trail. Luxury sheets with 540 thread count. 100% cotton but feel like silk. 4 pillows provided for the bed. Bed has cozy comforter with duvet cover. Enjoy the old fireplace in the living room in all seasons. Warmup on a cool fall evening or get cozy in the winter. Gas Logs are remote-controlled and ignite with the touch of a button. Brand new reclining furniture. 2-seat sofa and big easy chair. All recline. Old rocking chair and antique desk and chair. Quilt to cover up. 43" TV hooked to DirecTV. Sugar packets, Equal Packets, dishwasher soap, salt and pepper, coffee Mate, hand soap, canister sugar, paper towels, Dawn. Modern kitchen cabinets that include all needs that we can think of for dishes, serving bowls, utensils, pots and pans, coffee pot with 1st pot complimentary should you come in late. Dining in the kitchen with table that expands. Place mats provided as well as deluxe Oneida Stainless Steel utensils. Serving dishes are also provided. Deck off the back of the house with grill, table and chairs. Sit on deck and listen to Shorts Creek that runs beside the house. Visit the nearby areas of Fancy Gap/Blue Ridge Parkway 22 miles, Fiddlers Convention and museums is only 22 miles away. Visit Hillsville and the famous courthouse 14 miles, Wytheville and their festivals is 20 miles, New River Trail State Park is 4 miles, Shot Tower entrance to Trail is 1.8 miles. We really enjoyed our time at this rustic log cabin. All the comforts of home in this cozy little cabin. The owners were great to work with. Thanks so much for allowing us to stay at your cabin. Very clean, every thing you could need for a relaxing week end, hope to visit again ! Very unique, cozy, comfortable and well maintained. Located next to a babbling brook. Wonderful and cozy little cabin! My husband and I really enjoyed our stay in this cabin! It was the perfect little getaway place for us and our dog. This cabin is beautiful inside and out and has all the modern amenities you need. Looking forward to being able to stay here again sometime! Don't let the log cabin appearance mislead you! This was a perfect place for a fall getaway to enjoy biking along the New River Trail. All the comforts of home! Our stay at Kent's place was comfortable. The facilities were ideal and it is great to have many small details taken care of so did not need to make a run to store for this and that. We definitely recommend and hopefully will be back ourselves. Horseback Riding (rentals available) or bicycling on the New River Trail. Boat rentals also available, picnic areas. Visit the Old Shot Tower Park, 1.8 miles away on Rt 52. Cabin is private and gives a secure feeling as well as taste of the old ways. Newly redone, Fireplace, heat and air, grill.